Slow Cooker Middle Eastern Chickpea and Lentil Soup is beautiful, hearty and scrumptious. Quick to put together in the slow cooker, too. 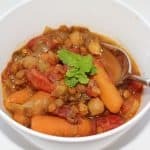 Slow Cooker Mediterranean Chickpea and Lentil Soup is filling, flavorful, vegan and gluten-free. 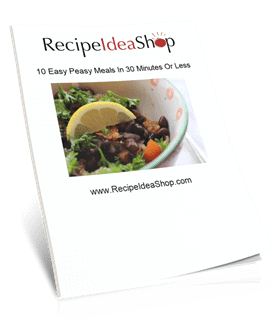 Try it over rice for a heartier meal. Hi. 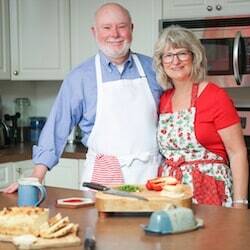 It’s Lois in the kitchen telling you about another wonderful slow cooker vegan recipe from Robin Robertson’s cookbook, Fresh from the Vegetarian Slow Cooker. It is truly my best slow-cooker resource. My version of Slow Cooker Middle Eastern Chickpea and Lentil Soup is delicious, of course. As usual, I changed several ingredients in the original recipe (adding more carrots, using ground ginger instead of fresh ginger—since I didn’t have any fresh—eliminating the lemon, and adding mint), but it’s based on Robertson’s “Moroccan-style Lentil and Chickpea Soup.” I think adding the mint made a huge difference. It was wicked good. I absolutely love this cookbook. Every. Single. Recipe. Is. Amazing. Robin Robertson’s Fresh from the Vegetarian Slow Cooker (paperback). Buy it today on Amazon. 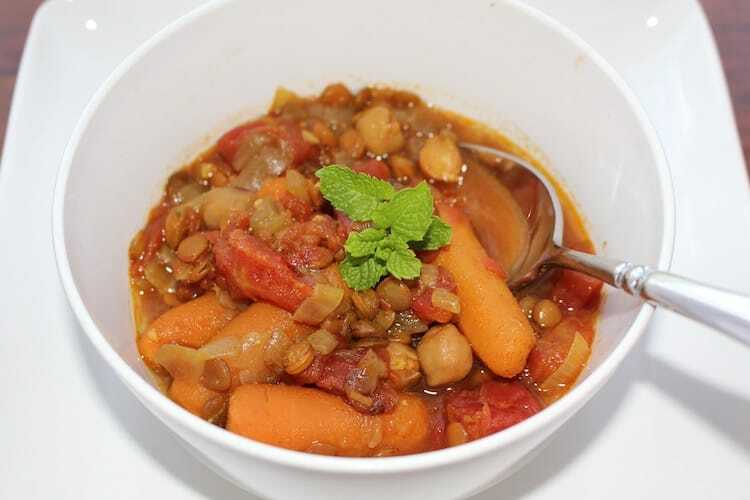 A bit of mint makes this slow cooker Middle Eastern Chickpea and Lentil Soup so bountiful. Lots of flavor and protein. Easy as 1-2-3. In a large frying pan, heat the oil until hot. Add the onions and cook over medium heat until the onions are transparent. Add the carrots and continue cooking for about 7 or 8 minutes, until the carrots start to brown a bit. While the carrots and onions are cooking, mix the spices and garlic in a small bowl. Pour this mixture over the carrots and onions and stir to make sure the vegetables are evenly coated. Dump this mixture into a 6-quart crockpot (slow cooker). Add the vegetable broth, tomatoes, lentils and chickpeas and stir to combine. Set the temperature to low, cover and cook for 6-8 hours until the carrots and lentils are tender. Slow Cooker Mediterranean Chickpea and Lentil Soup Nutrition Label. Each serving is about 2 cups.